On Monday, July 1st, a grand charity gala was held in support of the flood victims. 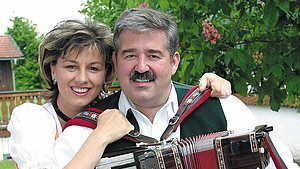 The event was initiated by the singing hosts Eva Maria and Thomas Berger. They staged the event because also a large number of people in Freilassing lost all they had to the terrible floods in June. Wenatex also supported the donation campaign and donated mattresses, bed bases and duvets with a sales value of around 50,000 Euros to concerned families.“Ainring helps Freilassing”: This was the motto of the charity gala, which was even attended by several popular folk music artists. Famous groups and solo artists such as Die Kastelruther Spatzen, Marc Pircher, Die Amigos, Die 3 Zwidern, Stefan Mross, Jazz Gitti, Semino Rossi and numerous other stars followed the call of the singing hosts Eva Maria and Thomas Berger and they all performed in support of the flood victims of Freilassing. The 3,000 person party tent at Rupertihof was completely full, the charity gala, presented by moderator Karl Moik, was a huge success – around 120,000 Euros in donations were collected on this evening. Wenatex also supported the donation campaign and gave families who fell victim to the floods a total of 60 mattresses, 60 bed bases and 60 duvets. The families were overwhelmed by so much solidarity, helpfulness and compassion.